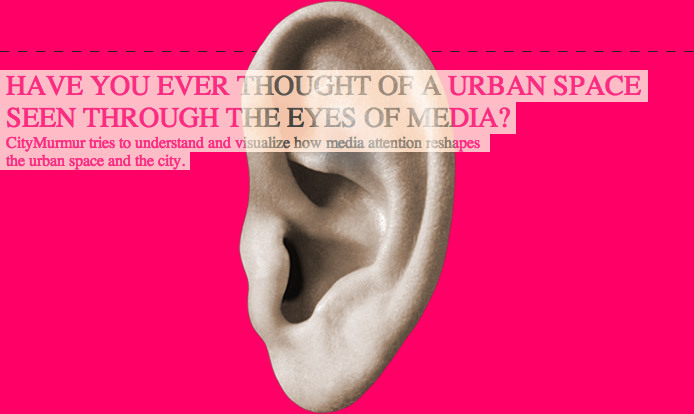 The goal of the project is to show how different media differently describe the urban space through the attention that is payed on each street of a city. In the hypothesis of the increasing importance of the on-line presence in contemporary society, a media geography has been generated intersecting the media scape with the geographical reality of the city. CityMurmur is an on-going project that will be performed in several cities. The first one was Madrid thanks to the possibility given by Visualizar'08 workshop (november 2008) and OpenStreetMap for the valid data. And now, ready for SIGGRAPH 2009, the city of New Orleans (Louisiana) is murmuring. Giorgio Caviglia took his Master Degree in Communication Design at the Politecnico di Milano with the thesis: The visualization of uncertainty - Tools to represent and explore the fuzzy nature of poverty. Since 2007 he is working as designer and website developer at whiterabbitwaslost.com. He's also assistant professor in the Communication Design course at Politecnico di Milano. He's now a PhD student in Design at the INDACO department of the Politecnico di Milano and collaborator of the Density Design team. Marco Quaggiotto is a Communication Design researcher with an interest in user interfaces for the exploration of complex systems. The aim of his research is to extend the tools of cartography beyond the geographical space, and to present the Atlas format as a narrative model able to intervene in complex, heterogeneous, dynamic realities. Currently, he's contract professor and research fellow at the Politecnico di Milano where he's working on a software prototype for the exploration of knowledge spaces and networks, and he's research scientist at the Complex Networks Unit of the Lagrange Complex Systems Group, working on the design of visual interfaces for real-life social and epidemic networks. Gaia Scagnetti completed her Ph.D. in Industrial design and Multimedia Communication at the Politecnico di Milano. Her thesis work - The design practice of complexity. Communication atlas for sustainable social integration - focused on the application of Complexity Science to the practice of Design in the context of social sustainable integration processes. Gaia has worked in the Density Design Lab team in Milan, where her research focused on information visualization and diagrams for decision making, problem solving and planning and she is now Design Researcher at Mobile Experience Lab of the Massachusetts Institute of Technology in Boston. Michele Graffieti is about to graduate at the Politecnico di Milano (Master Degree in Communication Design): his thesis is about the visualization of qualitative data. His freelance studio Graphieti Design is running since 1984, the year when he was born, but it took him a... little while to set it up (about 17 years). After this time, he has never stopped his activity, producing graphics, illustrations, websites, videos, set designs for theatre and bylaws (as a councilman in his local council). It's been a year now he's working as designer and website developer at whiterabbitwaslost.com; in 2008 he worked for 6 months for the Italian newspaper Corriere della Sera as web-designer and multimedia infographics artist. At present he is a collaborator of the Density Design Lab team. He is researching in a PhD thesis about semiotics and graphic journalism. In 2008 he took his Master degree in Communication Design at the Politecnico di Milano (Italy) with a thesis about the use of infographics as a tool for social communication. Nowadays he is working like infographic artist for the Spanish newspaper Público and for the last year he has been working like a multimedia infographics artist for the Spanish newspaper El Mundo. Consultant and teacher in communication design in different public and private institutions in Spain and Italy from 2001.